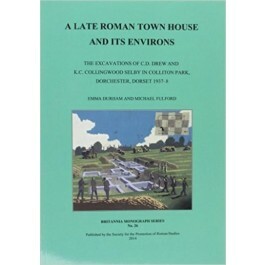 This report publishes the 1937–8 excavations in Colliton Park, Dorchester, Dorset, which revealed one of the best preserved late Roman town houses so far discovered in Roman Britain. Extensively decorated with mosaics, the building has recently been re-displayed in a new cover building by Dorset County Council. In addition to the town house and its mosaics, the report publishes the surrounding buildings in the north-west quarter of the town, also mostly of late Roman date, and associated occupation along with an extensive collection of artefacts, including outstanding finds of coins, glass, iron and Kimmeridge shale.